Imagine the crew of Monty Python meeting the cast Sesame Street on a pirate ship. 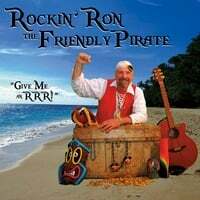 Its a boatload of Pirate FUN for kids AND adults (don't tell those Scurvy Dogs that some of the songs are educational). Rated RRR - for Pirates of all ages. 4. Aweigh and a Hey! 1) FP Rap (Pirates on Board Go RRR!) – cultural references are hidden like treasure in this old school (of fish) rap with funky bass by Aram Bedrosian, folky fiddle by Hannah Crary of the Fiddleheads, tasty guitar by Andre Maquera of 8084 fame, and background vocals by Irving Payne and The S & S Dudettes featuring Hannah Beatty, Dana Thomas, and Marcy Edelstein. (Check out the video on YouTube - type in FP Rap). 2) Welcome Aboard – a waltzing invitation to join the fun. My favorite part is the Easy Listening sing-and-whistle-along. Can you spot the allusion to a famous pirate? 3) I’m the Friendly Pirate – full of upbeat fun, this is my first pirate tune, and, it’s my flagship song. Don’t forget to repeat after me! Fiddle by Peter Miller. 4) Aweigh and a Hey! – chant and clap to pirate rockabilly. Banjo by Andre Maquera. 5) Buccaneer Bounce – Devo and the B52’s meet Captain Kangaroo on the deck dancing. Pirate’s challenge: can you sit still during this song?! 6) Pirates and Privateers – a brisk folk song offering brief biographies of several well known Pirates of the Caribbean. Hannah Crary of the Fiddleheads plays fiery fiddle! 7) Seven C’s – a boppy manifesto of Friendly Pirate values. Thanks to Ben Sage for the original lyrics of this song. Tracy Wolters picks a George Harrison-style guitar solo. 8) Pearl the Purple Pirate Princess – a sweet waltz with keyboard by Tracy Wolters and a string quartet arranged by Andre Maquera. Pearl’s part is sung by Wendy Maquera. 9) Twinkle, Twinkle Little StaRRR – the classic tune done Pirate-style. 10) Treasure of Smugglers’ Notch – a reggae-lite ditty delivering a riddle in song. 11) Cranky Pirate – a blast of pirate punk with the band Sour Boy rockin’ the ship!!!! Thanks to Daniel Snow who wrote some of the lyrics about Friendly Pirate’s disagreeable cousin. 12) Give Me an RRR! – the rousing title track featuring words with the ‘RRR’ sound. Drums by Spud. 13) Bones of Jonesy Davy – a haunting folk waltz with Michael Kennedy on the saw (that’s right, the kind that cuts wood) and spooky background vocals by Tracy Wolters. 14) FP Dance – pirate ship chores and merry movement to a beat. Swab the deck! 15) Pira-TUDE! – pirate vaudeville with chutzpah – HA! 17) Scurvy Dog and Scaredy Cat – a bouncy tale of two tails. Kazoo by Tracy Wolters. 18) Friend Ship – Reggae bass & guitars by Rudy Dauth of the band Pulse Prophets, drums by Spud, and background vocals by Wendy and Andre Maquera. This song is about friendship … a theme for me, and I hope for you, too. RRR Carter on lead & background vocals, guitar, handclaps, and dog panting. Tracy Wolters on background vocals, guitars, keyboards, percussion, and burp. Andre Maquera on bits and bytes.